Read more about how lessons we’ve learned at Mercy Home have taught us that partnering with your child’s education is a formula for success! Amy Williams, mother and social worker, shares five stress-relief activities that families with children of all ages can do together. 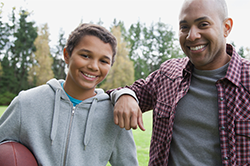 Mom and social worker Amy Williams suggests seven ways to help your teen learn job-readiness skills to help them get – and keep – a job! Amy Williams, mother and former social worker, shares ten ways to help focus on the positive and cultivate happiness as a parent. Guest blogger, mom, and former social worker Amy Williams shares summer fun activities for kids before the school year begins once again. Parents may find that it can be difficult to help make Lent matter to their kids. Learn how we help make the season meaningful for our kids at Mercy Home. Learn about four inexpensive or free eco-friendly activities you can do with your kids to celebrate earth and the environment every day of the year. Social apps are becoming increasingly popular. It’s important to have conversations with your kids and their presence online.